Introducing the first step-by-step guidebook for innovation planning! 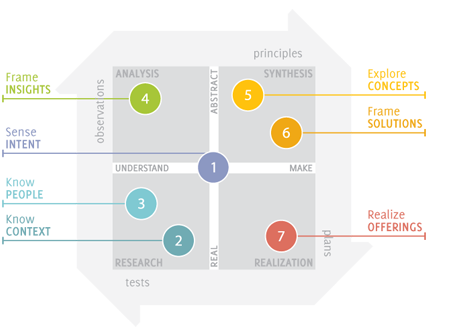 There are seven distinct modes of the innovation planning process: Sense Intent, Know Context, Know People, Frame Insights, Explore Concepts, Frame Solutions, and Realize Offerings. Each mode has its own goals and activities. 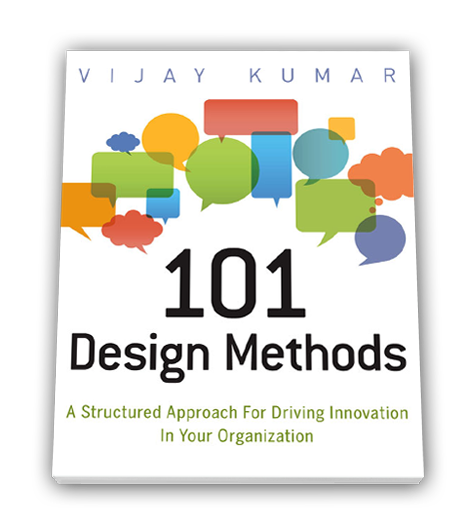 101 Design Methods: A Structured Approach for Driving Innovation in Your Organization introduces each of these modes as a separate chapter with a set of methods. Vijay Kumar is a professor at the Illinois Institute of Technology's Institute of Design in Chicago and leads the Strategic Design Planning and the Design Methods programs www.id.iit.edu. For more than 12 years he was the chief methodologist at Doblin Inc. (now a member of Deloitte) a leading global innovation firm based in Chicago www.doblin.com. With over 30 years of global work experience, Kumar has taught, published, lectured, and consulted throughout the world about how to use structured methods, tools, and frameworks for conceiving reliable human-centered innovations and turning them into strategic plans for organizations. His research is focused on framing up emerging innovation opportunities in education, health care, communication, retail, social reform, built environments, and emerging markets among others. He is the inventor of many methods, tools, and frameworks designed to uncover unexplored innovation opportunities. He consults with companies and organizations around the world for planning innovations using systemic, structured, and human-centered methods. He has consulted with Alamo, Amoco, Amway, Autodesk, Bose, Ceasefire, Cigna, Daishinsha, Hallmark, Kraft Foods, Lenscrafters, Liberty Mutual, McDonald's, Motorola, Pfizer, Procter & Gamble, SC Johnson, Shell, SAS Airlines, Steelcase, Target, Texas Instruments, T-Mobile, Wells Fargo, and Zurich Financials among others www.linkedin.com/pub/vijay-kumar/4/324/5bb/. Kumar is a frequent speaker and is widely published on the topic of innovation. He regularly conducts executive workshops on innovation for organizations around the world. He is the author of the best selling book on design thinking, "101 Design Methods: A Structured Approach for Driving Innovation in Your Organization" www.101designmethods.com. Recently, the Design Futures Council has named Kumar as an Honorary Senior Fellow for his “significant contributions toward the understanding of changing trends, new research, and applied knowledge that improve the built environment and the human condition” www.di.net/about/senior_fellows/. 101 Design Methods. All rights reserved.